Open your heart and do not be meek | Tears are not enough, what we need to do is act | Lend your time to fighting for the cause | Feel the sting and pain of poverty | How many children have been destroyed by poverty? | How many martyrs have offered their lives? Collaborated with Anakbayan, "Diwa ng Kasarinlan". Recognition of PATAC Youth Volunteers through the Ministry of Citizenship Volunteer Service Honours and Awards Program. Recognition of PATAC's volunteer contribution to S.E.A.S. Participation in various community events. Participation in various in community events, notably in "One Billion Rising", "Christmas event of S.E.A.S", participated in various fundraising events for flood victims. Raise funds for communities affected by Typhoons. 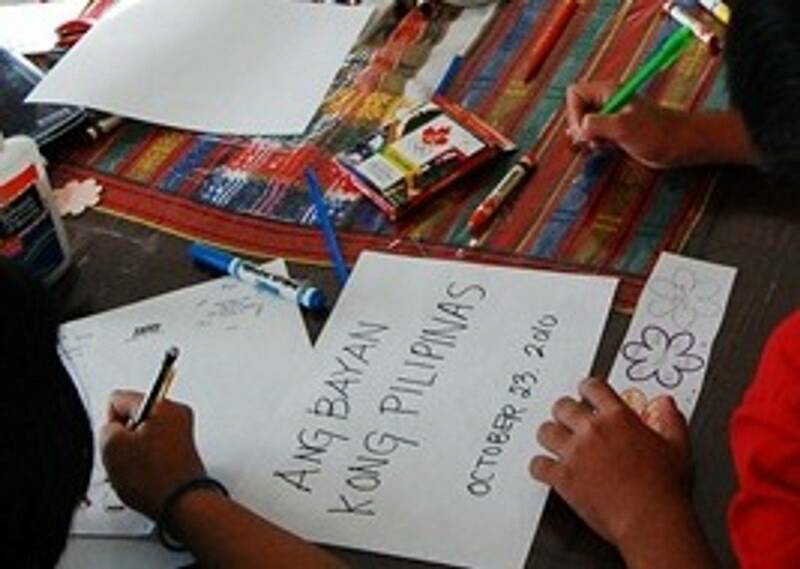 October 23, 2010 - "Ang Bayan Kong Pilipinas" - an annual fundraising event. 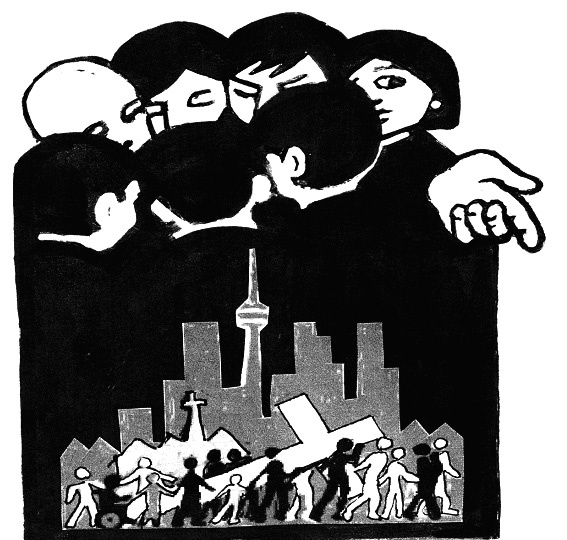 April 2, 2010 - Participating at the Good Friday Walk for justice and peace. "Such arrogance to speak of owning the land when we instead are owned by it. Only the race owns the land because the race lives forever." 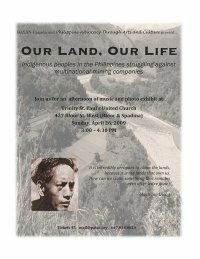 April 24 is Cordillera Day, a tradition commemorating the continuing struggle of the indigenous peoples of the Mountain Province for land and self-determination. 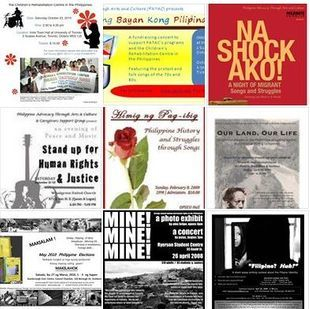 It began after the murder of Macliing Dulag on April 24, 1980, by Philippine military under Marcos government. Macliing Dulag was a chieftain of the Butbut tribe of Kalinga who led his people's resistance against the building of the IMF-WB-funded Chico River Dam on their ancestral land. 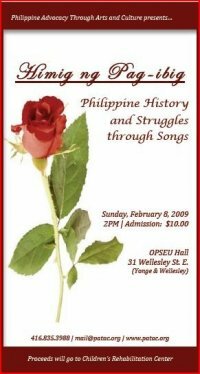 A valentine benefit concert for the Children's Rehabilitation Centre (CRC Philippines) featuring songs and music from selected era of the Philippine History. Featuring local talents from the community: Panyolito, Puede bang magsalita band, Dylan Hamada, Migrante Dancers, Dors, Mary Auxi Guiao and more. UNITY CONCERT, REBUILDING LIVES - major participation in the organization and implementation of this event. The first essay contest ever targeting the Filipino Canadian Youth. Three awards were given: Antonio Zumel award, Teodora Cabanela-Tsang Award and Loreto Sulit award. 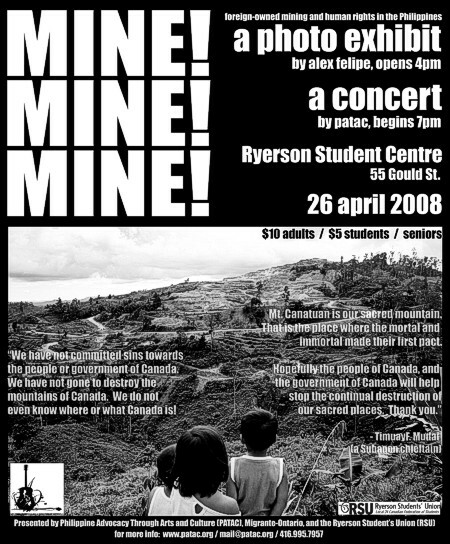 Mine, Mine, Mine is PATAC's contribution to the 2008 Earth day celebration. The photo exhibit by Alex Felipe displayed pictures from his trip to the Philippines in October 2007 to January 2008. 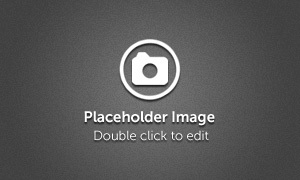 The first major project of PATAC was a combination of photo and arts exhibit and concert. 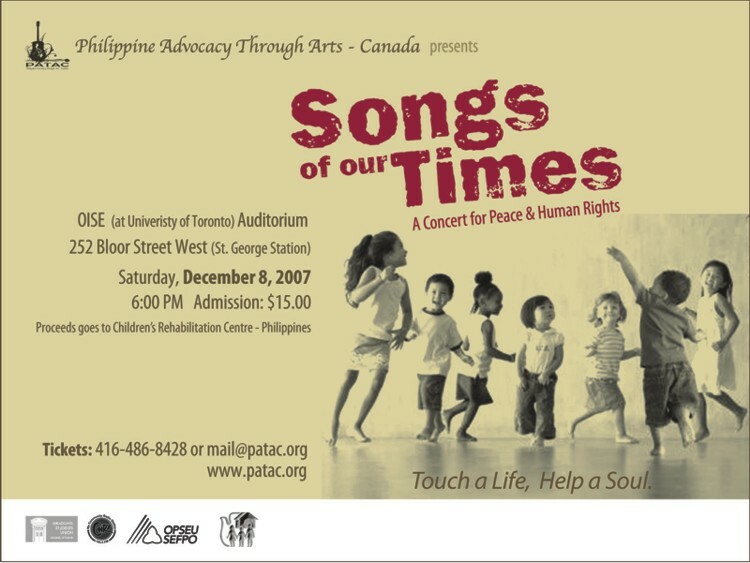 An evening of peace and music - Sep 2007, Never again. No to martial law.